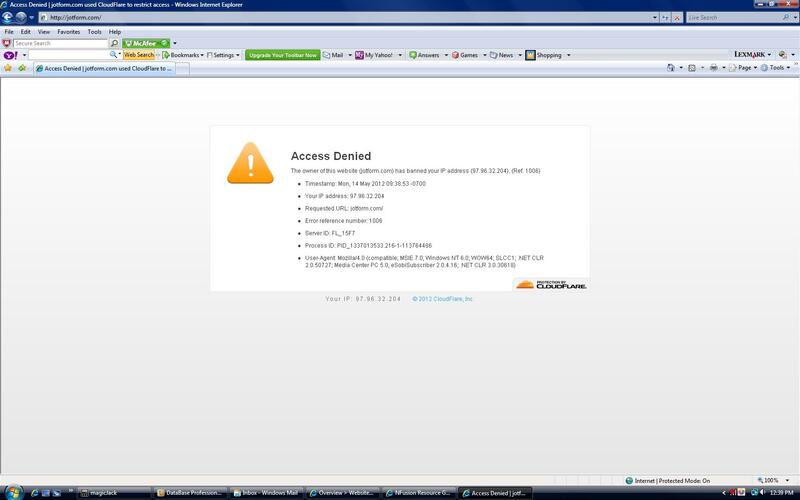 Why am I being denied access to your website? Here is the document that I you had requested. I noticed this morning that the websites nfusioncorp.com, healthcarejobfinders.net and healthcarecareersearch.com did not have the forms on them and when I went to type in jotform.com it says access denied. Last night I had cloned the Contact us and Submit Resume form so I could put them into Healthcarejobfinders.net and Healthcarecareersearch.com and they would still come to just one email, maybe I should have separate accounts for each? I then typed in several dummy responses to see if they were working properly. I also put up a website up for Connie this weekend (psychicconnietarot.com) but I did a separate jotform account for that one as I did not want this to interfere with my business. Please let me know what is needed to rectify the situation. I have looked at this account assigned to email address; nomultiple@gmail.com and found it is a guest account. A guest account is not registered and relies on cookies to identify the person who created the forms. The only way to have access to the submissions and the form itself is to use the same browser that was used when the form was created, that is, if the cookies have not been cleared yet. If the cookies have been cleared, I'm not 100% sure but I think there is no way to access the submissions anymore. So basically, it means that they're lost. Anyway, did you not have notification emails set up for that form? The best solution I can offer you is to import your form onto your new account and then re-embed the form in your site (if they were embedded).Click here to learn how to import a form. Just create an account and use your own email address. Your guest account will be merged with this new account. We are now using forms from emailmeforms.com, they seem to work better than the jot forms, but thanks for your assistance.